The Republicans at the top of the statewide ballot in Texas won their elections this year, but it was the state's least-populated and most-ignored counties that put them over the top. U.S. Sen. Ted Cruz campaigns on the last weekend before the midterm elections before 300 people in Victoria, Texas Bob Daemmrich/BDP Inc. Rural Texans might feel neglected, but given the geography of this year's election results, they ought to be getting a lot of love from the state's majority party. Republicans hold all of the state’s 29 statewide offices and still control the majorities in the Senate and the House and the congressional delegation. The statewide officials, in particular, were put back in office this month by what appears — on a map — to be a red state with some blue splatters here and there. But those blue spatters are where most Texans live. The rest of the state — most of that red part that you notice on the maps — is thinly populated. Republicans at the top of the ballot — from Ted Cruz and Greg Abbott down to the judges and justices on the state’s two highest courts — depend on overwhelming GOP victories in rural Texas to offset overwhelming Democratic wins in the urban ones. And in an election year when the reliability of conservative voters in the state’s big suburbs flickered and faltered, rural Texas voters can claim credit for the GOP’s continuing control of state government. Start with the results you know about: In the U.S. Senate race, Republican Ted Cruz finished with 50.9 percent of the vote, Democrat Beto O’Rourke got 48.3 percent of the vote, and the rest went to Neal Dikeman, a Libertarian. But ignore the regular maps and look at where the voters reside — and how they vote. It’s a picture of three very different electorates. The Texas Tribune’s recent “Future of Rural Texas” symposium included some polling of 172 of the state’s 254 counties defined by the federal government as “non-metro” areas. That’s rural Texas, by the U.S. Department of Agriculture’s reckoning, and it’s a part of Texas where Republicans did particularly well in the general election. While those 172 counties accounted for less than 12 percent of the overall voting in the state, Cruz got 73 percent and O’Rourke got 26.6 percent. Those counties are the reddest part of the map when you’re looking at the whole picture of Texas. On the other end of the spectrum — the centers of those blue splatters on the political maps — are the state’s urban counties. That’s where Democrats did particularly well in this year’s elections. In the state’s six biggest counties, which account for almost 45 percent of all the votes in the state, O’Rourke was the winner, with 61.8 percent to Cruz’s 38 percent. In the middle are suburban and exurban counties that have, for the most part, provided Republicans with a comfortable buffer in the races at the top of each year’s ballot. 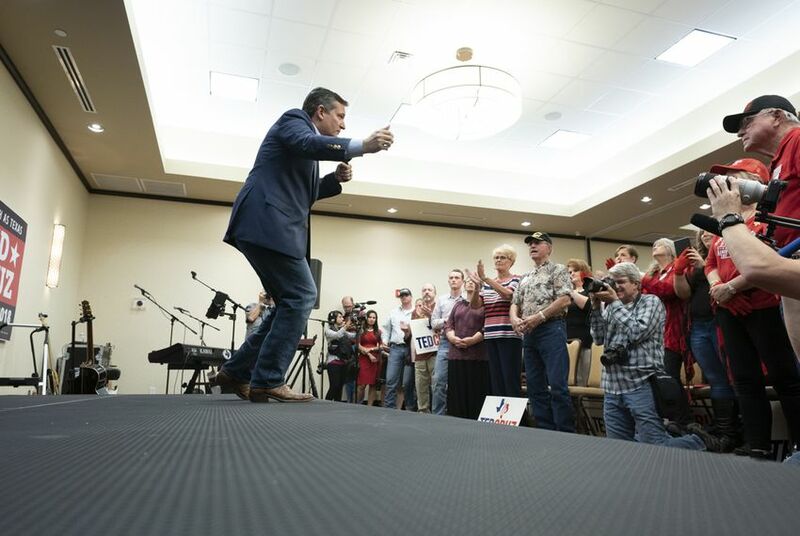 They were there for Cruz, but not in the same strength he saw in the state’s rural counties. In 30 Texas counties near those six biggest cities — counties that are part of metropolitan areas with more than a million people — Cruz got 59 percent of the vote to O’Rourke’s 41 percent. In the next group of 46 counties — considered to be part of metropolitan areas that have fewer than a million residents — the Republican’s margin was almost identical — Cruz 59, O’Rourke 41. The populations of those different kinds of counties matters, of course. The six biggest counties have about 45 percent of the state’s voters. The 172 rural counties have about 12 percent. The rest of us live in the suburbs of cities or in smaller cities around Texas. When you sort all of that out, O’Rourke beat Cruz by nearly 900,000 votes in the state’s urban areas. Cruz got more than half of that back in the suburbs and smaller cities in Texas. But it was rural Texas that saved him and the rest of the statewide Republican candidates — from Gov. Greg Abbott to Attorney General Ken Paxton to Agriculture Commissioner Sid Miller — from the Beto-driven blue surge. The rescue came from a part of the state that recently told pollsters a couple of interesting things about politics: 75 percent agreed that “voting gives people like me some say about how government runs things.” At the same time, 54 percent said “the state government pays too little attention to the problems and challenges facing communities” like theirs. Now they’re waiting to see if they’ll get a little love for their help.